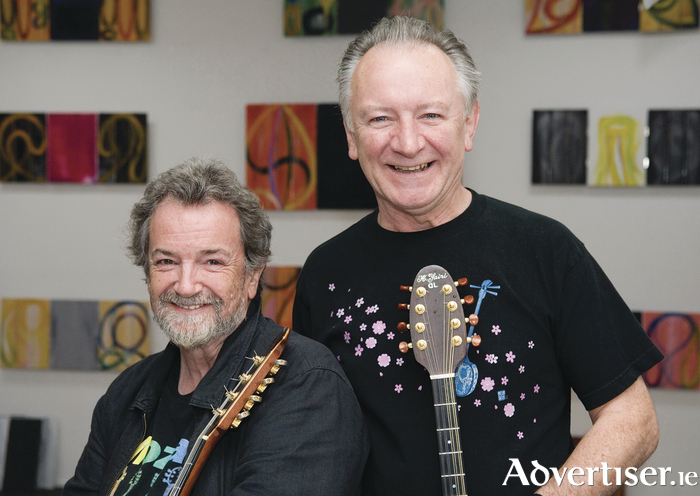 ANDY IRVINE and Dónal Lunny boast CVs and achievements like few others - Andy has been in Sweeney's Men and Patrick Street; Dónal in The Bothy Band and Moving Hearts; and together they have served in Planxty and Mozaik. The legends are again joining forces for the Galway International Arts Festival when they play Monroe's Live on Thursday July 16 at 8pm. Andy is a virtuoso on the mandolin, bouzouki, harmonica, and hurdy gurdy. He introduced Eastern European forms to Irish folk and with Paul Brady created one of the towering achievements of the genre, their 1976 'Purple' album. He has worked with Matt Molloy, Christy Moore, Arty McGlynn, Ronnie Drew, Johnny Moynihan, and Luke Kelly; and toured Europe, the Americas, Japan, Australia and New Zealand. Donal has also produced albums for Paul Brady, Elvis Costello, Rod Stewart, Indigo Girls, Sinead O’Connor, and Clannad. He also workjed with Kate Bush on her 1985 masterpiece, Hounds Of Love, as well as on 1989's The Sensual World. He is also credited with introducing the Greek instrument, the bouzouki, to Ireland. As he said: "I was dedicated to expanding the reach of traditional music". Tickets are €22/20. See www.giaf.ie.